St. Francis Monastery Novitiate Class of 1964-65. We knew practically nothing about the men. They appeared to be young like us but at the same time they seemed much older. They lived in a rigidly controlled religious environment but OH MY they could sing! ​Those of us in our late forties or older remember the Passionist era here in St. Paul. Not just the Monastery building, or the priests that slowly left us in later years, but the days of a full, vibrant Passionist presence. We had our own small local piece of Rome right here at home. It was a time when the monastery was full of active and retired priests and brothers. The bottom panels of the second floor stained glass windows were opened with priests looking down as Mass was said on one or more of the five altars in St. Francis de Heironymo Catholic Church. The monastery garden, built and maintained by the Passionist priests, brothers, and students, was occupied by religious men who were praying, meditating or simply strolling and visiting. ​At the time the monastery was also a novitiate—a place where young men assumed the role of novices, taking another step in their journey toward ordination. Many arrived by bus from the Mother of Good Counsel Preparatory Seminary in Warrenton, Missouri. These men came to St. Paul during our warm, sultry Kansas June. They were issued a heavy wool habit cinched with a wide leather belt and a pair of handmade sandals. This was what they wore during the heat of the summer, the cold winter and well into the following summer. Their seasonal comfort level was measured by the length of large, white stripes that extended down the armpits of the long-sleeved wool robe. Their time in St. Paul — June to July of the following year was 366 days — a year and a day. Camp Osage on The Neosho River (Note 1). ​I was a high school senior in 1964 and the novices appeared to be about my age, but they seemed much older. We saw very little of them outside of the church. Voices and laughter could be heard from the monastery garden and recreation areas. On rare occasions, a few hot, sweaty novices came to my parent’s grocery store for a soda and candy bar. They were always accompanied by a brother or priest who appeared to be treating his work detail. Occasionally, a few of them ventured out to do a community project, but always close to the church, and usually with supervision . Processions of novices, brothers, and priests were seen walking south on the gravel Udall Road toward the river and Camp Osage. We seldom heard them speak other than in muted tones to one another. Sometimes they wore jeans and shirts like the rest of us. but they were still different. 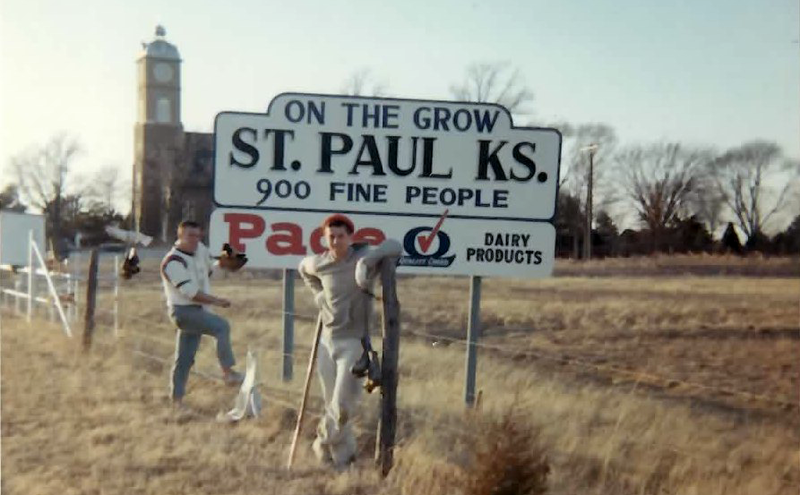 Two Students, in Casual Clothing Near an Earlier City Sign. But OH they could sing! About eight years ago one of the novices returned to St. Paul. Steve George was a member of the Class of 1965. He entered the monastery at about the time I graduated from high school and was likely among the men I recalled from my late teens. His group was also among the last because the novitiate closed in 1966. During a visit to the museum, another volunteer and I talked to Steve about the sense of mystery we felt about the students. We really knew very little about them. They were voices in the garden and faces in the church but there were no names and little knowledge of what they did. During our conversation, we talked about how wonderful the choir was. Steve smiled and said: “Yeah, we were good, weren’t we.” It was then that the other volunteer asked him to write a description of their time at the monastery — a day in the life of the novice. Steve agreed to do it. A Year and a Day - Now We Have a History. Steve solved his dilemma in a beautiful manner. A few months after his visit he came across a time line of world events that occurred while his group was in St. Paul. He wrote a side-by-side monograph comparing world events with his memories from the monastery life. Some of the novitiate memories are whimsical, others are dead serious. But when you consider the time  that his class was here it is a fascinating view of the contemplative, sheltered life of the novitiates vs an outside world in turmoil — and they were completely unaware. Click the illustration at the right to open his document. It is a fairly large file and will take a moment to download. Also linked HERE is an entry into his InFormation website. He built and used the site to convey the experiences of his class at, and beyond, St. Paul. He has also used it to keep up with the lives of his classmates and other Passionist novices. InFormation is a large and detailed site and the link will take you into the Saint Paul page. There is much more to the site. A Sample of What We Heard. In addition to his website, Steve has built a large library of Gregorian Chants produced as YouTube videos. As the chant plays, the video follows with words and musical notation. ​Click on the video at the right to hear and see an example - The Kyrie. But first, turn up your sound. Steve's YouTube page includes more than 250 files. All but a few are Gregorian Chants produced like this one. Follow THIS LINK to the page. The page has more than 15,000 subscribers and is approaching eleven million views. Take some time to look, listen and even subscribe to the page. Camp Osage was also known as the “father’s cabin.” It was about a mile south of the church on Udall Road, just southeast of an iron river bridge that has since been replaced. 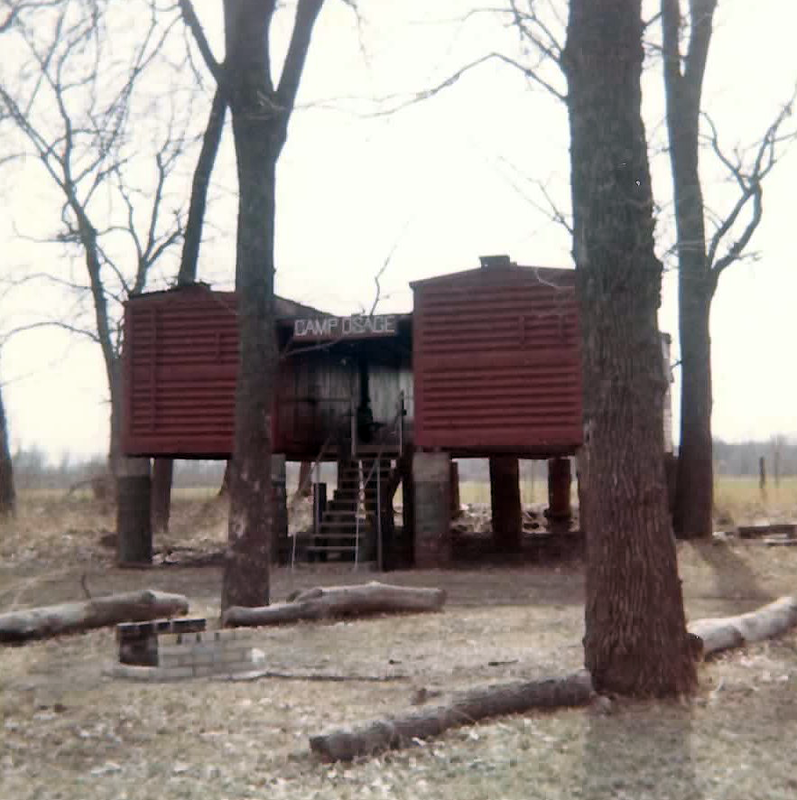 The cabin was a pair of railroad box cars elevated on concrete-filled oil drums with a covered breezeway between them. The cabin and surrounding area was also used by the community and Boy Scouts for gatherings, picnics, and camp outs. Some brave souls even dared to water ski between sandbars in the fickle depths of the Neosho River. Steve is not related to the local George families. After his time in St. Paul he decided to leave the religious life, but he certainly retained his personal interest in the Passionists. He has earned two master’s degrees, worked for Hewlett Packard, taught and worked as a website designer. He currently lives in Phoenix. His InFormation website, A Year and a Day monograph, and his YouTube works are fruits of his publishing and web expertise; as well as dedication to keep his Passionist memories alive. Steve knew some of us might not understand this statement. You will have to read his monograph “A Year and a Day” to understand. Steve asked me to relay to readers that his site has not been updated during the past few years. But it is still well worth your time to browse it. The banner photograph, the photos of Camp Osage and the two students are from Steve's InFormation Website. He credits the two latter photos to Mike Selby. 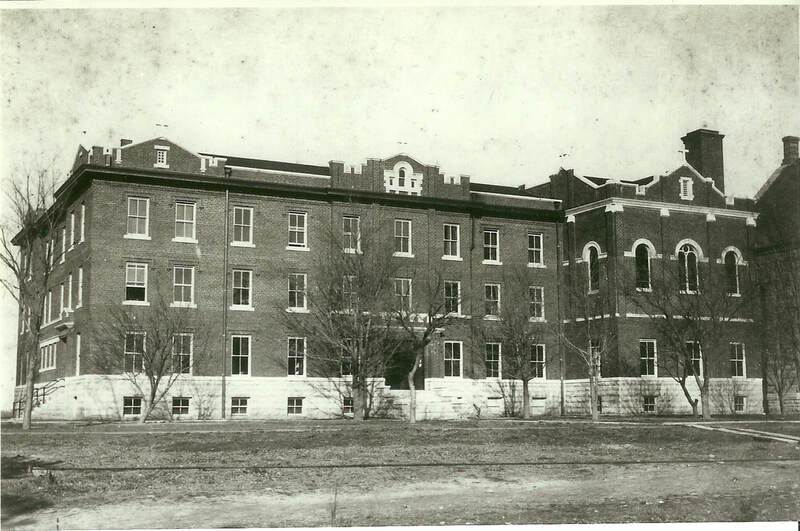 The photo of the Passionist monastery, St. Paul, was scanned from a photo on file with the Osage Mission - Neosho County Historical Society. The cover Icon that opens the A Year and a Day Monograph is also from Steve's site. All material from InFormation was used with his permission. The Article was written by Ron and Rosie Brogan of acatholicmission.org.